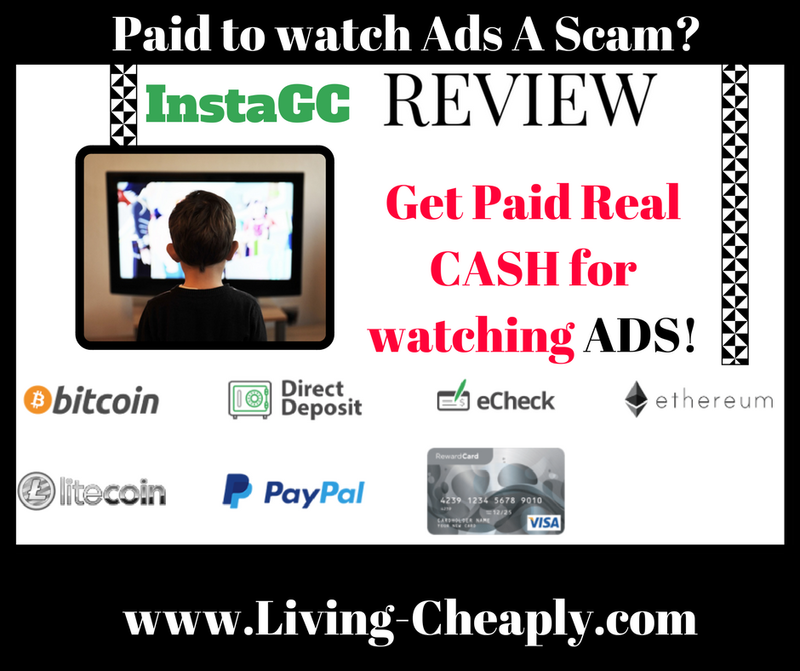 Home › Bitcoin › Cryptocurrency › earn online › Get Paid To Sites › Money Making Apps › Paid Surveys › Passive Money › Watch Videos › InstaGC Review - Paid to watch Ads A Scam? InstaGC Review - Paid to watch Ads A Scam? Limited Time Offer: Simply Go ➤ HERE check out InstaGC and obtain $0.10 points to start off with! Today we are going to be reviewing a site called InstaGC, a website which makes it possible to make cash from home by doing super simple tasks. It's FREE to sign up so no worries about any cost in fount. This reward site will shell out to you to do a number of offers such as doing surveys, watching videos, clicking ads, etc. Though, what makes this site different from alternative Get paid to sites is actually InstaGC's instant payments. You guessed it that's why their name starts with "Insta". This means your payment literally arrives as soon as your request it. They have an insane amount of payment methods to choose from. I counted 296 different types of Gift Cards at the time of this review. That is not including PayPal, Visa Pre-Paid Debit Cards, Check, Direct Deposit, Bitcoin, Ethereum, and LiteCoin! InstaGC is also one of the first websites of its kind and has been around since 2011 paying its users via its various different payment methods. It's also worth mention they pay one of the highest rates you will find for these type of sites. ➤ Doing Simple Tasks such as Printing Coupons. ➤ Searching the Internet just as you would with any search engine. ➤ Signing Up for FREE Offers such as a free trial offered by scribd audiobook company. ➤ Signing Up for Paid Offers such as a Hulu Trail offer. ➤ Listening to Music while you doing whatever it is you normally doing on the web. ➤ Clicking on Paid to click Ads. ➤ Crowdflower Tasks which are simple internet research data entry type tasks. ➤ Downloading Apps, Games, and software on your Apple, Android, or Windows devices. Read Living Cheaply's complete review on this site and discover what we managed to find out. Sadly many scam reward company's exist just to get your private information without ever intending to shell out to you a dime for your effort. So I am guessing you are asking yourself if InstaGC could perhaps be one of these company's right? Well, they are in fact a legit site that I personally have been using and getting paid by for years. They operate out of the United States and were founded in 2011 around 6 years ago. 6 years and 264 days to be exact at the time of this review. Getting Started With Site is really simple. Just follow these 2 steps! Make sure you confirm your email. This obviously means you will need to use an email that you have access to when signing up. Depending on the email provider you use the message could end up in your spam folder. All Done!! Now you're ready to start getting paid to Watch Videos, Surf the Web, Click Ads, Do Signups or whatever other simple tasks you prefer. This site has a huge selection of tasks to choose from as you could expect from a site that can be considered ancient in the world of Get Paid To Sites. My favorite methods for earning on this site include Watching Videos, Printing Coupons, and Searching The Web, and Visiting websites. Watching Videos ➤ Clearing Cookies often helps maximize the number of ADS that will be available to you. Also its important to keep in mind they have 7 different ways to earn cash for watching videos. All of these methods can be found under the Videos tab. This is including their own in-house videos. Which will look something like the photo below. That being said the others are good as well. Offers ➤ Clearing Cookies often also helps with maximizing likely hood of acceptance of almost any other type of offers as well. Surveys ➤ If for some reason you are disqualified when attempting a Survey you will still be awarded one point for trying. Crowdflower ➤ Check out Living Cheaply's Guide to maximize your Crowdflower earnings by reaching Level One Quickly with our simple tips. Paid Downloads ➤ Leave apps on your device for an hour or so after you open it and do what is required. Search Engine ➤ Use InstaGC's search engine instead of whatever you normally use and you will be surprised how many points you may earn over time. Paid Trails ➤ Use the prepaid Visa Gift Cards you earn to do Paid Trail Offers to avoid ever having to worry about getting random charges on your credit down the road. You will receive a bonus when your friends sign up for you. You will earn 10% of what your friends earn. However, this does not include any bonus they receive. This is fairly common for what you will see for any of the Get Paid To Sites. But they also offer 10 bonus points just for your friend signing up. This is not so common and can be nice. The referrals will have to be from the United States, Australia, Canada, or United Kingdom, however, to qualify for the 10 point bonus. For all other nations, you will receive the 10% but not the initial 10 point bonus. They have a flat out ridiculously large selecting of payment methods. ➤ Around 300 different types of Gift Cards including Amazon. They Also have a very wide range of points you can redeem as you can see below ranging from $1.00 to $150.00. Check out what you can expect when redeeming for an Amazon Gift card in the photo below. InstalGc is a legit website that has been for ages on site of its kind. It has a proven track record of paying their users instantly. I earn and redeem cash almost on a daily basis from this site myself. It's worth mentioning you must redeem at $50.00 of other payment methods before you unlock a few of the methods such as PayPal. There is never any type of fees for being a member of this site. They also never do anything shady things with your personal data. This is one of my number one recommended sites. With a wide selecting of methods to earn including maybe my favorite passively watching videos. Also paying a high rate for all such tasks. Makes this site a good option for passive earnings. I would also recommend you look into Earnhoney, Koinme, and Yoolotto. These 3 sites were built specifically for passive video watching earning. ➤ Also, we recently did a review of a site similar to this one called Earnably. So you may want to check that review out as well. Living Cheaply would love to hear about your experience with InstaGC in the comments below.